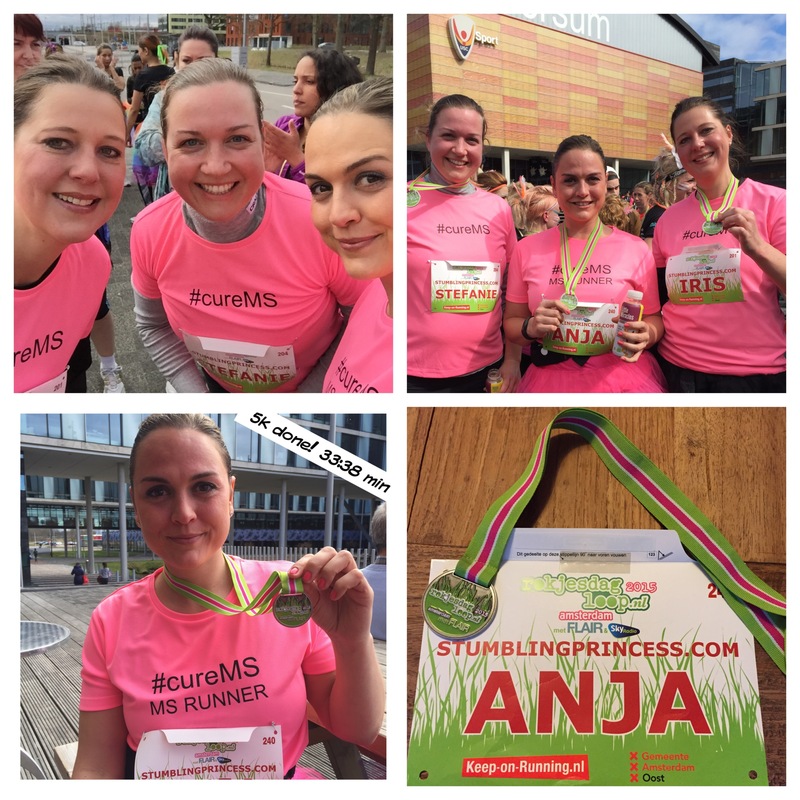 We started and finished the 5k Rokjesdag Run ( “Skirt Day Run”, that’s why most runners wore one) together as a team and thanks to my friends Steffi and Iris I even managed to run through the entire distance without a sneaky walking break for the very first time since MS joined my life. It was a great event with more than 900 female participants. There was a 1k kids run, the 5k and 10k run and last but not least, a 5k walk that also included wheelchair users. Unfortunately we missed the finish of the walking teams as we started shortly before these teams returned. We crossed the finish line as a team, holding hands and I must say I felt a bit emotional as 2 years ago I could have never imagined that one day I’ll run again. 2 years ago, simple things like taking a shower resulted in a nap and here I was, passing the finish line of a 5k RUN, crazy! It took us 33:38 min to finish the 5k which is better than I expected! I was able to collect 360 Euro for MS Research thanks to your donations, the total amount raised for this event was 21.215 Euro which will go to the VUmc MS Center. Fantastic! Well, the day after the run I signed up for my next 5k on April 26, the Pop-Up Run, together with my friend Steffi. I need to have another goal or I’ll quit running, lol. At first I wanted to sign up for the Nike “We own the Night” 10k in May but, as it’s only a few weeks away, I know it would be too much on my body to train for that distance in such a short time. It took already quite a toll to train for the 5k and honestly, especially my social life was pretty much on hold the past weeks as I felt even more exhausted, so I’m not willing to do that again. I will focus on 5k runs for now and try to improve my time. I’m also super happy that many of you, with or without MS, felt inspired to start running again!